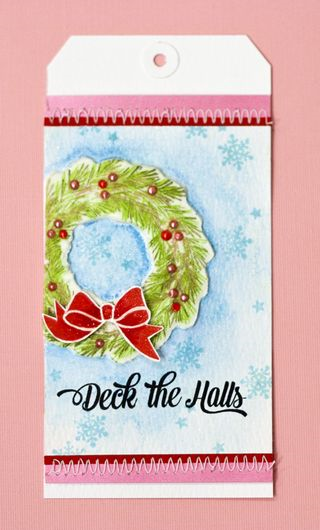 I started out by die cutting a tag in watercolor paper and one in Craft-A-Board. Next, the holly image from Impression Obsession was stamped on the watercolor tag in Ranger Jet Black Archival Ink. I used my water brush and Derwent Inktense pencils to color the holly image. Then it was outlined with a blue Inktense pencil and I used my water brush to pull the color throughout the whole tag. The little Hero Arts snowflakes are stamped in Peacock Feathers Distress Ink. Then the sentiment from Inkadinkado was stamped in the Ranger Jet Black Archival Ink. 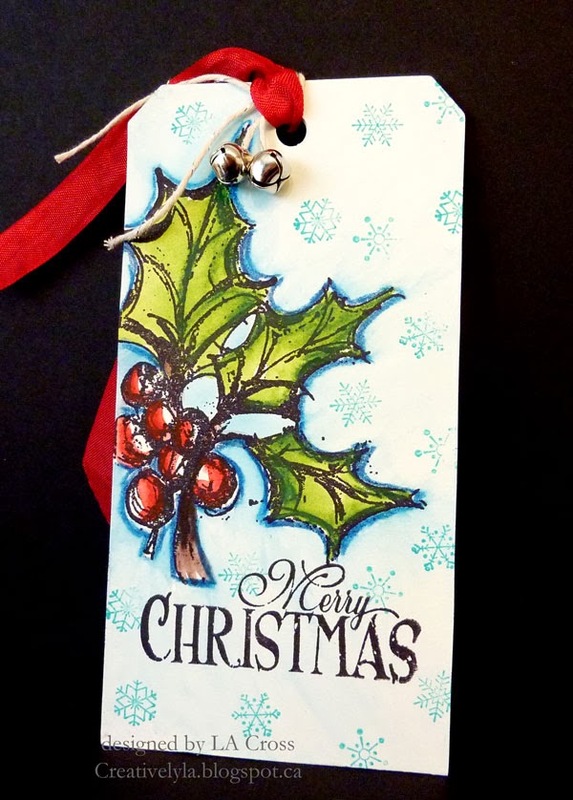 Some ribbon, cording and a couple of little bells complete the tag. Beautiful tag! Thanks so much for sharing the details. This is certainly inspiration to pull out the Inktense pencils. This is stunning! Love how you used the Inktense pencils to color so beautifully. The holly and berries were just made for this watercolor technique. Of all your tags, I believe this one's my favorite. It's amazing that you are completing all 12–what an accomplishment! Good luck on the prize drawing. Funny you say that Beulah Bee…this is my favorite too!